SNOMED CT is the most comprehensive, multilingual clinical healthcare terminology in the world. It is owned, maintained, and distributed by the SNOMED International, United Kingdom. It is a widely used terminology and contains comprehensive active concepts with unique meanings and formal logic-based definitions organized into hierarchies. 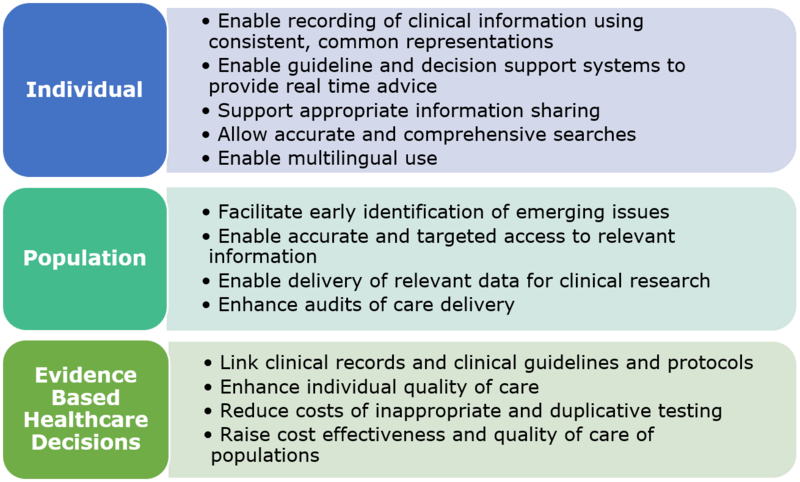 Incorporation of such a comprehensive terminology in EHR requires understanding of the underlying concept model, various levels at which clinical information can be effectively represented, and cross-mapping to other international vocabulary standards. SNOMED International is an international not-for-profit organization based in London, United Kingdom. SNOMED International is a product and service organization. It owns and administers the rights to SNOMED CT and related terminology standards. SNOMED CT is a clinically validated, semantically rich, multilingual, comprehensive clinical terminology that can be used to represent clinically relevant information consistently and reliably in an electronic health record. It provides a standardized way to represent clinical phrases captured by the clinician. SNOMED CT based clinical information benefits individual patients and clinicians as well as populations and also supports evidence based care. Affiliate Licensing is required to keep the NRC informed about the usage to SNOMED CT by the affiliate. The biannual releases of the SNOMED CT International files will be available to the affiliate.